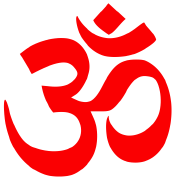 The most sacred Hindu mantra "Aum" (Om). A mantra (from Sanskrit: man- "to think" and -tra meaning, tool) literally means "instrument of thought." Originating in ancient India out of Vedic Hinduism, mantras serve a variety of functions and are especially popular as aids to meditation and devotion. As powerful sound vibrations, mantras encompass various forms of sacred utterance (syllable, scriptural verse, or sacred formula), which can be repeated silently or chanted for different purposes such as instilling concentration, facilitating spiritual growth, and helping to visualize a deity. It is said that a mantra, when recited with proper understanding and intonation, can revitalize the mind with mystic power and help deliver it from illusion to enlightenment. Mantras have also been used in religious ceremonies to accumulate wealth, avoid danger, or even allegedly to eliminate foes. In addition to Hinduism, mantas are also used by Buddhists, Jains, Tantrikas, Sikhs and followers of some new religious movements. The practice of prayer in the Abrahamic religions is said in some ways to have a similar function to mantras. The earliest recorded use of mantras is found in the Vedic scriptures of Hinduism, which contain many references to the sacredness of sound. These Hindu texts describe speech itself as a goddess (known as "Vac") and praise her power and potency. Additionally, sound became an important part of Hindu rituals and great care was taken to ensure the proper elocution of the Vedic hymns for the efficacy of the sacrifices. The Brahmin priests were responsible for chanting the sacred Vedic hymns to the gods during the sacrificial rituals. A high degree of importance was placed on the correct chanting and pronounciation of Sanskrit sacrificial formulas. Eventually, the sound Aum became a symbol for ultimate reality itself -the great Brahman- represented by this mantra. In Vedic times, writing was definitely seen as inferior to the spoken word. The Brahmin priests were charged with preserving the Vedas by oral transmission. For years, they were the only ones who knew the mantras that were chanted to maintain the cosmos and sacred order (Rta or dharma). However, with the advent of egalitarian Hindu schools of Yoga, Vedanta, Tantra and Bhakti, it is now the case that mantras are passed on freely as part of generally practiced Hindu religion. Such was the influence of the more orthodox attitude of the elite nature of mantra knowledge that even the Buddhists, who repudiated the whole idea of caste, and of the efficacy of the old rituals, called themselves the shravakas, that is, "the hearers." A wise person in India was one who had "heard much." Mantras then are sound symbols. What they symbolize and how they function depends on the context, and the mind of the person repeating them. Since Buddhism arose in India, and was deeply influenced by Hindu teachings, it is not surprising that Buddhism also adopted and inherited the Hindu practice of Mantras. However, the Buddhists put their own distinctive stamp on Mantra practice. 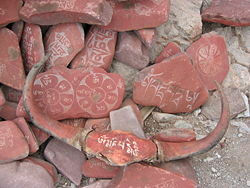 When Buddhism travelled to China a major shift in emphasis towards mantras occurred. China lacked a unifying, ecclesiastic language like Sanskrit, and achieved its cultural unity by having a written language that was flexible in pronunciation but more precise in terms of the concepts that each character represented. Hence the Chinese prized written language much more highly than did the Indian Buddhist missionaries, and the writing of mantras became a spiritual practice in its own right. Thus, whereas the Hindu Brahmins had been very strict on the correct pronunciation and intonation of mantas, the Chinese, and indeed other Far-Eastern Buddhists, were less concerned with the spoken form than correctly writing mantras down. The practice of writing mantras, and copying texts as a spiritual practice, became very refined in China, Tibet and Japan. Mantras have two components of primary importance - Meaning and Sound. For the mantra to be effective, great emphasis is put on both correct pronunciation and the level of concentration of the mind on the meaning of the word or words that are recited. This emphasis on correct pronunciation resulted in an early development of a science of phonetics in India. It was recognized that words do have a mysterious power to affect human beings. Since the term mantra is derived from the roots: "man" (to think) and the action oriented suffix "tra," a mantra can be translated as a linguistic device for deepening ones thought, or in the Buddhist context for developing the enlightened mind. However it is also true that mantras have been used as magic spells for very mundane purposes such as attaining wealth and long life, and eliminating enemies. Indeed, Dr. Edward Conze, a scholar of Buddhism, frequently translated "mantra" as "spell," and one scholarly etymology links the word mantra with "manas" (meaning "mind") and 'trâna' (for protection) making a mantra something which protects the mind. Indeed, vocal sounds in India are frequently thought of as having magical powers, or even of representing the words or speech of a deity. There are various purposes of mantras depending on the religious school involved, and intention of the practitioner. It is often said that the purpose to mantras is to deliver the mind from illusion and material inclinations and to bring concentration and focus to the mind. It is claimed that a mantras can change one's consciousness, help the devotee attain one-pointedness, or concentration on the chosen deity or principle idea of the mantra. The vibrations and sounds of the mantra are considered extremely important, and thus reverberations of the sound are supposed to awaken the prana (breath or spiritual life force) and even stimulate chakras according to many Hindu schools of thought. The earliest mantras are found in the Hindu scriptures known as the Vedas. They contain hymns of praise to various gods and supplications for support and blessings. These mantras or sacred chants were similar to prayers but their efficacy was contingent upon their proper pronunciation and ritual purity of the priests who chanted them. Over time, the most famous of all Hindu mantras became Aum, which is called the "pranava mantra" (the source of all mantras). Aum is considered to be the most fundamental and powerful mantra, and thus is prefixed and suffixed to all Hindu prayers. It represents the underlying unity of reality, called Brahman, the godhead, as well as the whole of creation. Merely pronouncing this syllable is said to allow one to experience the divine in a very direct way. Over time, various mantras developed in Hinduism that were dedicated to different gods. It is common in modern Hinduism to form a mantra by taking a Hindu deity's name and saluting it in the following way: "Aum namah (insert deity's name here)" or "Aum Jai (Hail!) ------" or several such permutations. Common examples are "Aum namah Shivaya" (Aum, I bow to Lord Shiva), "Aum Namo Narayanaya"; or "Aum Namo Bhagavate Vasudevãya," (Salutations to the Universal God Vishnu), "Aum Shri Ganeshaya Namah" (Aum to Shri Ganesha) and "Aum Kalikayai Namah" and "Aum Hrim Chandikãyai Namah." (i.e., mantras to Devi.) While these mantras invoke individual Gods or principles, the most fundamental mantras, like 'Aum,' the 'Shanti Mantra,' the 'Gayatri Mantra' all ultimately focus on the One underlying reality. One of the main forms of puja, or worship, in Hinduism is repetition of mantras (called Mantra japna), which is said to lead to moksha/liberation. Essentially, Mantra Japa means repetition of mantra, and has become an established practice of all Hindu streams, from the various Yoga to Tantra. It involves repetition of a mantra over and over again, usually in cycles of auspicious numbers (in multiples of three), the most popular being 108. For this reason, Hindu malas (bead necklaces) developed, containing 108 beads and a head "meru" bead. The devotee performing japa using his/her fingers counts each bead as he/she repeats the chosen mantra. Having reached 108 repetitions, if he/she wishes to continue another cycle of mantras, the devotee must turn the mala around without crossing the "meru" bead and repeat. Any shloka (scriptural verse) from holy Hindu texts like the Vedas, Upanishads, Bhagavad Gita, Yoga Sutra, even the Mahabharata, Ramayana, Durga saptashati or Chandi are considered powerful enough to be repeated to great effect, and have therefore the status of a mantra. Some other famous Hindu Mantras are the "Gayatri Mantra" invoking the universal Brahman as the principle of knowledge and the illumination of the primordial Sun, and the popular "Maha Mantra" (see insert above) found in Gaudiya Vaishnavism. Popularized by the modern Hare Krishna movement, this mantra comprises of the names Hare, Krishna and Rama sung together. In the sixteenth century, Caitanya Mahaprabhu (considered an incarnation of Krishna), founder of Gaudiya Vaishnavism, along with his followers, spread this mantra across India through public congregational chanting (kirtan). Caitanya and his followers traveled from town to town singing this mantra, allegedly bringing salvation to whoever happens to hear it. When A.C. Bhaktivedanta Swami Prabhupada established ISKCON (the International Society for Krishna Consciousness), a branch of the Brahma Madhva Gaudiya Vaishnava sampradaya, he brought the "Hare Krishna" mantra to the West and spread it around the world as an easy yet sublime way of liberation in the Age of Kali. In Tibet, many Buddhists carve mantras into rocks as a form of devotion. Buddhism developed its own system and understanding of mantra, which took on its own particularities. The scholar Edward Conze distinguishes three periods in the Buddhist use of mantra. He states that, initially, like their fellow Hindus, Buddhists used mantras as protective spells to ward of malignant influences. Despite a Vinaya rule that forbids monks engaging in the Brahminical practice of chanting mantras for material gain, there are a number of protective mantras for a group of ascetic monks. Later mantras were used more to guard the spiritual life of the chanter, and sections on mantras began to be included in some Mahayana sutras such as the White Lotus Sutra, and the Lankavatara Sutra. The scope of protection also changed in this time. In the Sutra of Golden Light, the Four Great Kings promise to exercise sovereignty over the different classes of demigods, to protect the whole of Jambudvipa (the Indian subcontinent), to protect monks who proclaim the sutra, and to protect kings who patronize the monks who proclaim the sutra. The culmination of this type of approach is the Nichiren school of Buddhism, founded in thirteenth century Japan, which distilled all Buddhist practice down to the veneration of the Lotus Sutra through recitation of the daimoku: "Nam myoho renge kyo" (meaning "Homage to the Lotus Sutra"). Around the seventh century, mantras began to take centre stage in Buddhism and become a vehicle for salvation in their own right. Tantra began to flourish in India at that time. Mantrayana was an early name for the what is now more commonly known as Vajrayana. The aim of Vajrayana practice is to give the practitioner a direct experience of reality, of things as they really are. Mantras function as symbols of that reality, and different mantras are different aspects of that reality—for example wisdom or compassion. Mantras are almost always associated with a particular deity, with one exception being the Prajnaparamita mantra associated with the Heart Sutra. One of the key Vajrayana strategies for bringing about a direct experience of reality is to engage the entire psycho-physical person in the practices. So a typical sadhana or meditation practice might include mudras, or symbolic hand gestures, or even full body prostrations; the recitations of mantras; as well as the visualization of celestial beings and visualizing the letters of the mantra which is being recited. Clearly here mantra is associated with speech. The meditator may visualize the letters in front of themselves, or within their body. The sounds may pronounced out loud, or internally in the mind only. Probably the most famous mantra of Buddhism is "Om mani padme hum" the six syllable mantra of the Bodhisattva of compassion Avalokiteshvara (Tibetan: Chenrezig, Chinese: Guan Yin). The Dalai Lama is said to be an incarnation of Avalokiteshvara, and so the mantra is especially revered by his devotees. The mantra is usually translated as "The Jewel in the Lotus" (meaning what?)' The Brahminical insistence on absolutely correct pronunciation of Sanskrit broke down as Buddhism was exported to other countries where the inhabitants found it impossible to reproduce the sounds. So in Tibet, for instance, where this mantra is on the lips of many Tibetans all their waking hours, the mantra is pronounced Om mani peme hung. "Thanks to the original vows of the Buddhas and Bodhisattvas, a miraculous force resides in the mantras, so that by pronouncing them one acquires merit without limits" (Conze, 183). The Shingon philosopher Kūkai (774-835 C.E.) advanced a general theory of language based on his analysis of two forms of Buddhist ritual language: dharani (dhāra.nī) and mantra. The word dharani derives from a Sanskrit root dh.r which means to hold, or maintain. Ryuichi Abe suggests that it is generally understood as a mnemonic device which encapsulates the meaning of a section or chapter of a sutra. This is perhaps related to the use of verse summaries at the end of texts as in the Udana which is generally acknowledged as being in the oldest strata of the Pali Canon. Dharanis are also considered to protect the one who chants them from malign influences and calamities. The distinction between dharani and mantra is a difficult one to make. We can say that all mantras are dharanis but that not all dharanis are mantras. Mantras do tend to be shorter. Both tend to contain a number of unintelligible phonic fragments such as Om, or Hu.m which is perhaps why some people consider them to be essentially meaningless. Kukai made mantra a special class of dharani which showed that every syllable of a dharani was a manifestation of the true nature of reality. Thus rather than being devoid of meaning, Kukai suggests that dharanis are in fact saturated with meaning—every syllable is symbolic on multiple levels. This mantra-based theory of language had a powerful effect on Japanese thought and society which up until Kūkai's time had been dominated by imported Chinese culture of thought, particularly in the form of the Classical Chinese language which was used in the court and amongst the literati, and Confucianism which was the dominant political ideology. In particular Kūkai was able to use this new theory of language to create links between indigenous Japanese culture and Buddhism. For instance, he made a link between the Buddha Mahavairocana and the Shinto sun Goddess Amaterasu. Since the emperors were thought to be descended form Amaterasu, Kūkai had found a powerful connection here that linked the emperors with the Buddha, and also in finding a way to integrate Shinto with Buddhism, something that had not happened with Confucianism. Buddhism then became essentially an indigenous religion in a way that Confucianism had not. It was through language and mantra that this connection was made. Kūkai helped to elucidate what mantra is in a way that had not been done before: he addressed the fundamental questions of what a text is, how signs function, and above all, what language is. In this manner he covered some of the same ground as modern day Structuralists and others scholars of language, although he came to very different conclusions. Mantra practice has also been enthusiastically taken up by various New Age groups and individuals, who often teach that the mere repetition of syllables can have a calming effect on the mind. For example, Transcendental Meditation (also known simply as 'TM') uses what the group refers to as 'simple mantras' - as a meditative focus. TM was founded by Maharishi Mahesh Yogi. According to the TM website (see below) the practice can result in a number of material benefits such as relaxation, reduced stress, better health, better self image; but it can also benefit the world by reducing violence and crime, and generally improve quality of life. Simple two-syllable mantras are used. Mantras are also an important part of Sikhism. In Sikhism Mantras (or "Mantars") are a Shabad (Word or hymn) from Gurbani to concentrate the mind on God and the message of the Ten Gurus. The main mantras of Sikhism are the famous "Gurmantar," and the "Mool Mantar." Chanting is the process of the continuous repeating a mantra. When a mantra is sung or chanted, whether by oneself or in a group of devoted aspirants, it is termed as Kirtan—the glorification of God. Prayers may also be sung in a Kirtan. The singing and chanting of Kirtan creates an elevated mental condition for practicing meditation or entering into an intense form of spiritual practice. Kirtan is a powerful and unique method of recharging the subconscious with spiritual vibrations. The Sikh doctrine of "Namm Japna" (meaning "repetition of the name of God) requires Sikhs to cultivate constant remembrance of God in their daily lives. Some forms of Jewish practice use mantras, although they do not call them by that name. Hasidic Jews sing phrases from the Hebrew Bible over and over, in a form of rhythmic chant, often accompanied by drumming on the table. They also use wordless sacred meditation tunes called niggunim, which are revealed through the higher consciousness of the Rebbes (Hasidic leaders, similar to gurus). Some subgroups of the Breslov Hasidic movement use the mantra Na Nach Nachma, based on the name of their founder, Rabbi Nachman of Breslov. All of these practices are done to achieve deveikut (meaning "cleaving (holding on) to God"). In the Islamic Sufi tradition, chanting the 99 Names of Allah is an invocation of Allah's attributes. In Christianity, repetitive prayer using prayer beads (such as a rosary or chotki) includes well known mantras such as the Jesus prayer and Hail Mary. A form of Christian meditation was taught by Dom John Main that involves the silent repetition of a mantra. Gelongma Karma Khechong Palmo. Mantras On The Prayer Flag. Kailash - Journal of Himalayan Studies 1 (2) (1973): 168-169. Higgins, David and Christine Kachur. "RELST 110.6-World Religions (Extension Division Study Guide)" Saskatoon: University of Saskatchewan, 2002. The Rider Encyclopedia of Eastern Philosophy and religion. (London: Rider, 1986. This page was last modified on 4 December 2015, at 20:19.